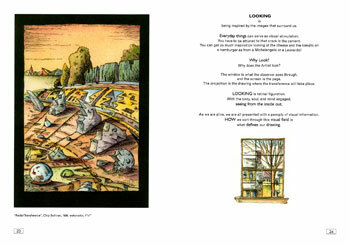 For more information about acquiring a copy of this book, contact Chip Sullivan. "0pen your eyes, you have only to see things properly to understand them." 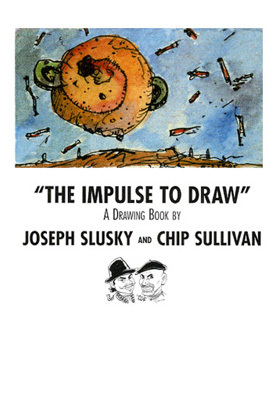 The Impulse to Draw: A Guidebook to the Imagination is a powerful, dynamic and eye-popping guide to the creative process. The manuscript reveals the inner workings of the creative mind, the reverie of the imagination and the transformative power of drawing. 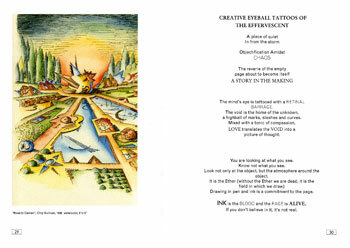 The Impulse to Draw is profusely illustrated with poetic insights, humorous allegories and substantive techniques designed to launch the reader on his or her own journey of self-discovery. The integration of word and image engages the reader at a deeply personal level by demonstrating the power of visual communication to unlock creative potential. 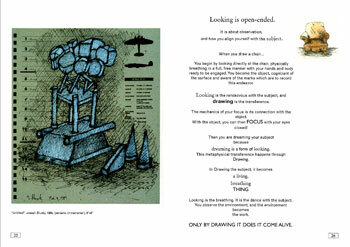 The work presents an entirely new philosophy about creativity and drawing. This manuscript was originally developed by the authors as a university level text but its appeal went far beyond the academic market. It was created to help people visualize and imagine space in entirely new ways. A running commentary throughout the book is punctuated by stimulating questions and tools that can compel the reader into action and creation. 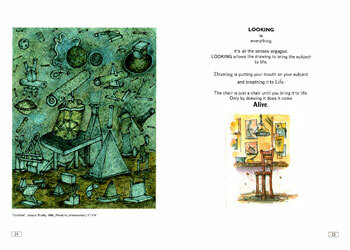 References and illustrations by other artists reinforce the content. The Impulse to Draw differs in many respects from most other drawing and writing books. Slusky and Sullivan have a very unique and dynamic approach to creativity and inspiration that is part philosophy, part poetry. More abstract and less didactic than the typical "personal growth" title, The Impulse to Draw presents a new metaphysics that is inspiring, unpretentious, sometimes enigmatic, and yet gets directly to the core of the creative process. It guides the reader to have faith in his or her ideas, and removes the fear of personal expression.